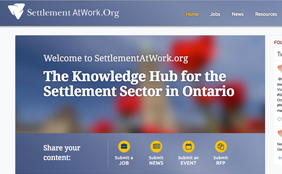 The SettlementAtWork.Org website has professional development resources and news for front-line workers, program staff, managers and administrative staff. The goal of this site is to help workers prepare to best serve their newcomer clients, and to help organizations support their staff. SettlementAtWork.Org is divided into two parts, a French-language website providing time-sensitive information and a bilingual Wiki. The website features news items, professional development events, job postings and requests for proposals of interest to the sector. The bilingual Wiki serves as a collaboration tool for accessing and sharing information on sector projects and initiatives, as well as, resources including research reports, manuals and guides for best practices and online training opportunities.